Sony today announced its latest Walkman portable media player – one offering an impressive battery life. Under the ‘big screen, big battery life’ banner, the new ultra-slim Sony NWZ-A820 Walkman offers a very impressive 36 hours of audio playback, or 10 hours of video. That’s a lot more than the five hours of video and 24 hours of music the Apple iPod manages. Even with Bluetooth stereo enabled, playback stretches to seven hours of video or 15 hours of music, Sony said. Specs include a crisp 2.4-inch QVGA screen for high quality AVC and MPEG-4 video playback at up to 30fps, Bluetooth connectivity, wireless DR-BT21G headphones and up to 8GB storage capacity. There's also support for Windows Media Audio (WMA), DRM-free AAC, MP3 and Linear PCM music formats, plus JPEG files for photos. 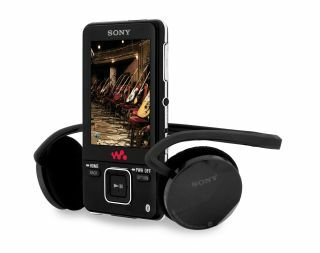 The Sony NWZ-A820 Walkman is available in black, and two sizes are available: 4GB and 8GB. Pricing has yet to be confirmed nearer to the release in April.